But, right now my dreams are angry. And I can’t help it. I guess I am going through a bit of emotional turmoil right now and I feel so confused. I’m in the angry stage of grieving right now. And that’s ok. In fact, its grand. It gives me something to focus my attention on and also something to fight through. I don’t expect anybody to really understand exactly how I am feeling, and it’s alright if you don’t. It’s what I have to work through. Because of all this emotional angst I am experiencing, there are things in my life that are suffering. I may not be the most fun to be around. Maybe, I am not fun at all. I’m alone, but not lonely because I don’t allow that. I am happy to just be. If I stumble upon a reminder of my mama in my home, and believe me there are many, I may cry, I may smile, I may laugh at a good memory. And that’s alright. With the Brooklyn Half Marathon 7 weeks away, I really want to try to put aside some of what I am feeling emotionally, and follow my awesome training plan that Coach Caleb made for me. Or maybe even better, use my emotional turmoil and turn it into something positive. My runs, as of late have not only been difficult, but sluggish and dragging. I am not hydrating enough. I am not eating healthy enough. I am not doing any of the things I need to do to run healthy. And lets face it, if your an emotional wreck, it almost always effects you physically. I’ve been extremely tired. Had to deal with emergency root canal that left me in pain and crying. Have an on again, off again sore throat and cough and my sleeping patterns are way off. I don’t feel 100% healthy, yet I can’t really pinpoint what exactly is ailing me. Today, I completed a LSD 10 miler and I am mighty proud that I persevered and got the miles done. Alone, a boring route and hardly any motivation, yet I pushed through and got it done. It sure was Long and Slow. Wednesday night, as long as I have two feet and a heartbeat, (heard this in a trailer of a movie, I forget which) I will be attending a speed workout over at Paragon Sports Nike Speed. Should be lots of fun and intense. I know that things will eventually fall into place and I also know or maybe think that at 6 weeks since my mama passed away, most people are not wanting to hear me talk about it anymore. I may be wrong about that, and I hope I am wrong, but I probably won’t be bringing it up much anymore. I am trying hard to not let this blog drift into obscurity but I am finding it difficult to find topics to blog about. Hopefully, when my running is back up to where I want it to be, I will feel more determined to keep this blog going. My life has taken a turn one way, and this blog is way at the other end of the road. Very far. Very far away. And I feel very far away. And so very tired. I may hit the trail a bit myself. But, not to worry, if you need me just HOLLA. 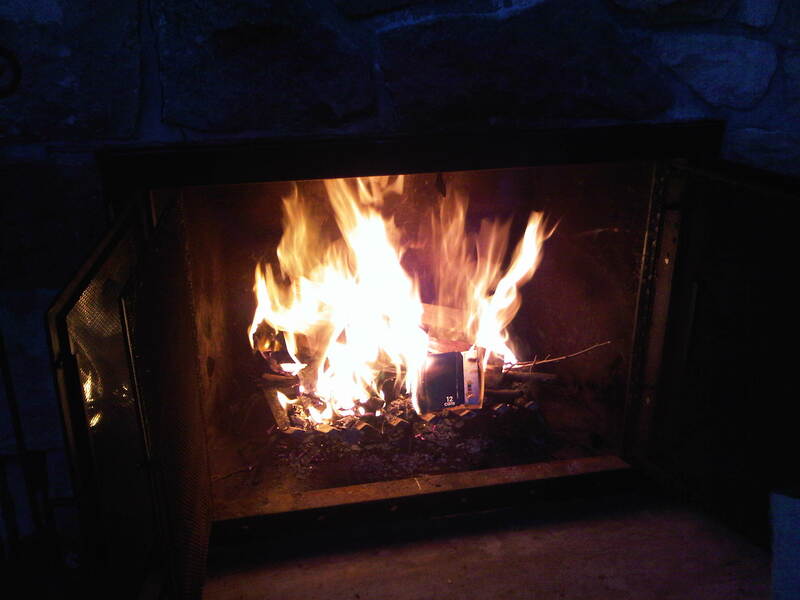 Everybody likes the feeling of warmth. Most people get caught up in all of the complications that life throws at them. I could list a multitude of them here on this post, but today I want to keep it simple. Simple and warm. This past weekend I had the pleasure of spending time with TK who simply put, is awesome. She invited me up to her “pretty awesome” house in the Poconos, PA. With the way the weather had been lately, I was worried about even making it up there, but luckily the snow had stopped and gave to us this simple beauty. Friendship doesn’t ever have to be complicated and it shouldn’t. You are either going to hit it off and become friends, or your not. Simple. I’d say TK and I became friends this past weekend. Not that we weren’t friends before, but I truly think TK knew that I needed this get-a-way. She knew and she gave to me a simple way to get out of my own head and relax, eat, bake, blog, twitter, read, run and LAUGH. Laugh. March 25th was TK’s birthday and when she awoke that morning I sang the Happy Birthday song and then I played youtube videos of other people singing the Happy Birthday song. You know, like real singers “The Beatles” I think she enjoyed that. Oh and the cake. How can I not talk about the cake. Banana Nutella Cake with Cream Cheese Frosting. Perfect in its imperfections. So delicious, I kinda want a piece right now. So, we had two great runs up in the Poconos. It’s the mountains and quite hilly. I regretted not bringing my climbing poles and ropes because, quite frankly we were climbing on those runs. TK and friend BG may giggle and say NAH. But they also simply agreed with me that I was climbing mountains. Great birthday run with @pigtailsflying in the Pocono’s Pennsylvania. (not my birthday) Elevation gain 112 feet. I thought it felt like 10,000 feet. What do I know? After mile 1 I told TK, I had to stop for a bit to catch my breathe. This was simply for two reasons. Yes, I did need a bit of a breathe catcher, but also it was TK’s birthday run and I wanted it to be a great run for her. So, I urged her on and told her I would be alright running the loop alone. Simple. Second run was the next day with TK and new friend BG. Another great run, I think. Terrific leisurely run with TK and BG. sort of around Lake Naomi in the Pocono’s. I felt bad that I slowed them both down to an easy trot but there were some hills and it was a little cold. 5 Miles 56.11 Ran the WHOLE THING. I am ecstatic that I was able to spend this time with a friend. It really made a simple world of difference in my life. 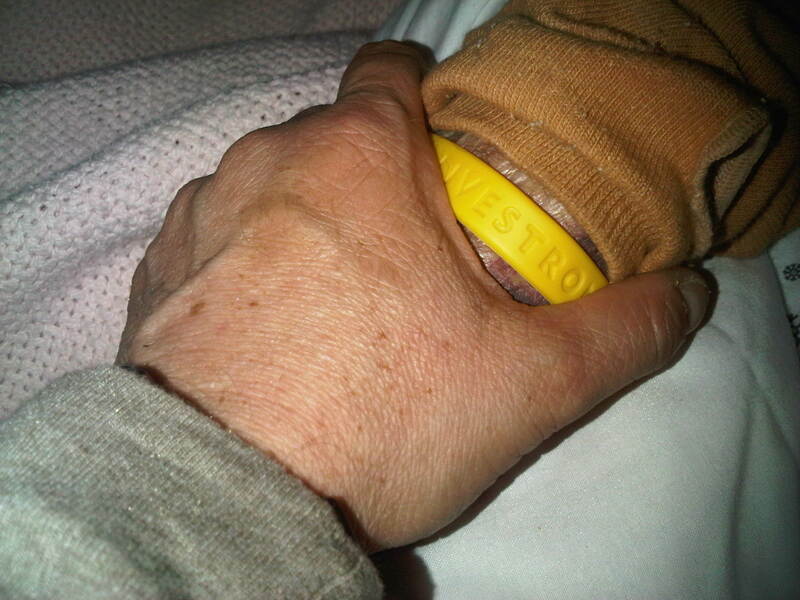 February 21st 2011 6.30pm – holding my mama’s hand. Today is exactly 1 month. Wow. The time is escaping me. Every day that passes is one more day without my mama in this world. I am not saying its getting any easier, but somehow I am doing what I promised her I would do. Living? Being alright? I’ll be OK? Getting the things done that needs to be done when one passes on. The paperwork. The cancelling of things in her name. The returning of any checks in her name. All difficult and all things I don’t want to do. Yet, I did them all. I am sure there will be more. And I know I will do what has to be done. I guess it’s called responsibility and being a grownup. I’m trying to go back in time and remember her when she wasn’t sick. It’s a little hard for me to do this and that is upsetting me very much. So, I have to dig deeper into my brain and find the memories that I know are there. Tomorrow, I go back to training for real. I think I have a speed workout to do and I will give it my all. Whatever that all is tomorrow. In between all of that, I fell of my bike and thought I broke my shoulder and had to have emergency root canal on an infected tooth and gum. I was in terrible pain for 3 full days – pain that brought tears to my eyes. Pain, that I knew if my mama was here, would not feel so bad. She always had a way of making me feel better when I was sick. In the Jewish religion there are various stages to mourning, but I am following my own stages. I honor my mama every single day. Just by thinking about her, loving her and remembering her. I’d like to share the poem I read at her funeral. I am the starshine of night. I am the flowers that bloom, I am in a quiet room. Do not stand at my grave bereft, I am not there. I have not left. It seems worse at night. My thoughts, I mean. When I finally crawl into bed with just the thought of sleep in my brain, my brain decides to wake up and spin in hundreds of different directions. 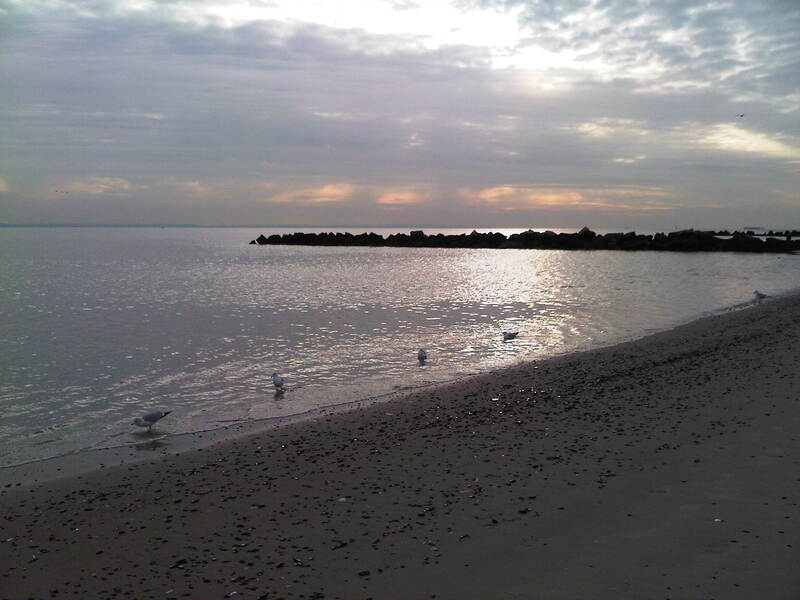 I try to think about my run the following morning and what it will feel like. I try to think about all the good things that are happening. I really try. But my thoughts go right back to my mama. Sometimes, I just think about how much I miss her. Sometimes, I think about how soft her hand felt when I held it. But mostly, I go over in my head her last days. I don’t understand why I do this. Why am I wanting to relive it in my brain every night? I don’t get it. Mama passed peacefully last night at 8.15pm. I want to tell you this story. I was with her all day long, holding her hand, stroking her hair and face and telling her how much I love her and how proud I was of her. I also told her, mama it’s ok, I will be alright. At 7pm I left to get something to eat and run to the store for milk. At 7.55pm hospice called me and told me to come back quickly. I got there as soon as I could. Mom passed 5 minutes before I got back. I went in and held her. She looked peaceful like a beautiful angel. I kissed her forehead, held her hand, put my head on her chest and hugged her. I then left the room to call my sister. I know this much: my mama held on all day because she knew I was there and her last gift to me was to hold on until I left and then she let go. I believe this. She was that unselfish. She was that giving. If I can be the kind of giving caring person she was, I will live up to that always. Every single nurse, doctor and anybody else who came in contact with my mama, loved her. Just loved her. She blew kisses to everybody. She never once complained. She lived her life to the end with dignity. I miss her so so much. My heart hearts. I think for right now, this is all I want to share about her last days. Perhaps, in the future I will blog more about how amazingly brave and courageous she was. Perhaps. Or maybe I will tell you how funny she was even when she was in the hospital and was having to endure test after test. I’m pretty sure she didn’t complain once. Oh wait, yes she did. One day when I arrived she was sitting up she looked at me and said “I was waiting for you” Did you at least have lunch?” No? Alright thats not quite a complaint. More like a mom concerned if her child ate. Even when she could not eat. Even when she wanted to eat, but knew she couldn’t swallow because it caused her to aspirate. I hated that part so much. There were many many times I couldn’t do things. I missed many races and runs and meet ups. But, I was right where I wanted and needed to be. It was such an enormous pleasure to take care of my mama. She struggled and I helped her lessen the struggle. I made her laugh and I know she laughed at my lame jokes even when they weren’t really funny. She had physical therapy and after the PT left she always repeated the exercises to show me she can do it. Even in the hospital when she took a few steps with the walker she was so proud. I was so proud. There is such a huge void in my life now. It is exactly 17 days since my mama has passed away. There has not been 1 day where I haven’t thought about her or had a reminder of her in some small way. The support and friendship I was given throughout and after has been nothing short of a miracle for me. I truly don’t think I could have survived all of this without all of you. Just thanking you all doesn’t seem enough. Yet, that is all I can offer you. So thank you. Thank you for being there. Thank you for the food platter. Thank you for listening. Thank you for the plant, flowers, love, cards, laughter. Thank you for listening to me vent. Thanks for making me laugh and cry too. This post was going to be a bit about my running, but I think I will save that for the next post. Yes. I will do that. Wow, its been a while since I blogged. I thought it was about time to finally write a post in the new year. Hope you all had a great Holiday/New Year time. Goals and resolutions still being kept? 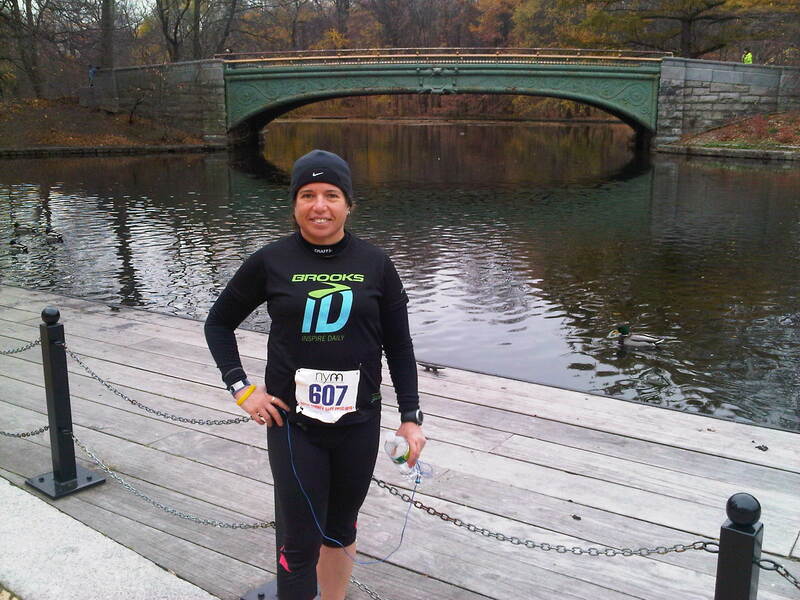 As I blogged on November 12th HATRun I announced that I would be running a 50k. And I was really excited about the prospect of the training all the way to the actual event plus getting to meet so many fellow friends and runners. And then I found myself in a situation that I was really hoping would get better. It hasn’t. My mom had to spend 6 days in the hospital at the beginning of December. It was a very scary time for me because even though my mom has leukemia, she NEVER had to be hospitalized. So this was really her first experience in a hospital setting. Many tests were given including a CAT scan of her brain. The results were age appropriate atrophy. Now we all know that atrophy is the partial or complete wasting away of a part of the body. The doctor told my sister and myself that most older people’s brains start to “look old”. There are changes that you wouldn’t see in a younger patient. However, not all older people’s lives are IMPACTED by those changes. Her life is IMPACTED by these changes and in turn my life is severely IMPACTED by the changes in my mom’s brain. With all that said, and with a lot of discussion and thinking, I have decided to pull out of running HATRun. First, I am severely undertrained and don’t want to risk injury. I think my running is going really well right now and as a friend said to me, there will always be 50k races to run. Second, I simply can’t plan that far ahead. I am living one day at a time. What makes me really sad is the fact that I won’t even be able to attend the big Dailymile dinner planned the night before. In my mind, I know in the big picture its not that big a deal, but when you start to really look forward to something, even the smallest thing is the biggest deal. My mom cannot be left alone in the apartment. So, right now I do have some help coming in, but because of the insurance my mom has, that will be ending sometime in February so I am now in the process of looking for help. I so don’t know what I am doing. I am not used to having people coming in and out of my home and neither is my mom. We have a physical therapist, speech therapist and a home health aid. I am not very good at telling people what to do, but yet I do it. I never really thought I would become my mom’s parent. I realize this may sound totally selfish, but sometimes, I need my mother to be a mother. But she can’t. I am a chef, caretaker, laundry doer, I am chief financial officer here at home. I am pretty much the boss. Sometimes, I see a glimpse of who my mother was, but then it goes away. She still has a good sense of humor and makes me laugh so I try to make her laugh. I love her and want her to live the rest of her life in comfort and knowing she is loved and cared for. So, for now, I will focus on local races and just running when I can for as long as I can. The Manhattan Half Marathon is this Saturday and as long as my sister is here, I should be able to run it. My running is my therapy. It my “me” time. It is really and truly my only time that I am alone with my thoughts and alone, period. It has been so long since I have seen any of my friends twitter, dailymile, runners, non-runners. Sure, I have constant contact with everybody, but its never the same as spending real time IRL. But, anybody that knows me, knows I am going to stay focused on the positives. If I focus on the negatives too much, the positives will diminish in my mind. My number one priority is my mother. Her health. And my family. Then, all else will fall into place, I think. Now, I don’t know about you guys, but I am getting tired of this long long winter. Snow snow and more snow. Make it STOP!!!! In the meantime, I am embracing every pretty day I can. Life is meant to live. So don’t feel badly for me or my SITUATION!!! OK? Today, December 30, 2010 I hit 1000 running miles for 2010. Anti climatic? Yes. Bittersweet? Absolutely. A dull ending. Nothing spectacular happens at the end. Trivial or commonplace. Just throwing the words out there. Its 1000 miles and its no biggie considering all of my friends hitting anywhere from 1500-3000 for the year. But, its MY 1000 miles and I did it on my own terms. I did it mostly alone and thats fine with me. Last year I had the company of great friends. Some I met for the first time that very night. And in 1 year we are all still friends. I used to call all of these folks my “running friends”. But why make that distinction? We are all FRIENDS. Runners or not. Yes running brought us together and kept us together but that is just a little part of who we all are. This year while I was alone, I had incredible support. My sister and mom. All of my friends. Everybody at Dailymile and Twitter. All of you. So for that I thank you. As far as my run today, well it was slushy and kinda cool. 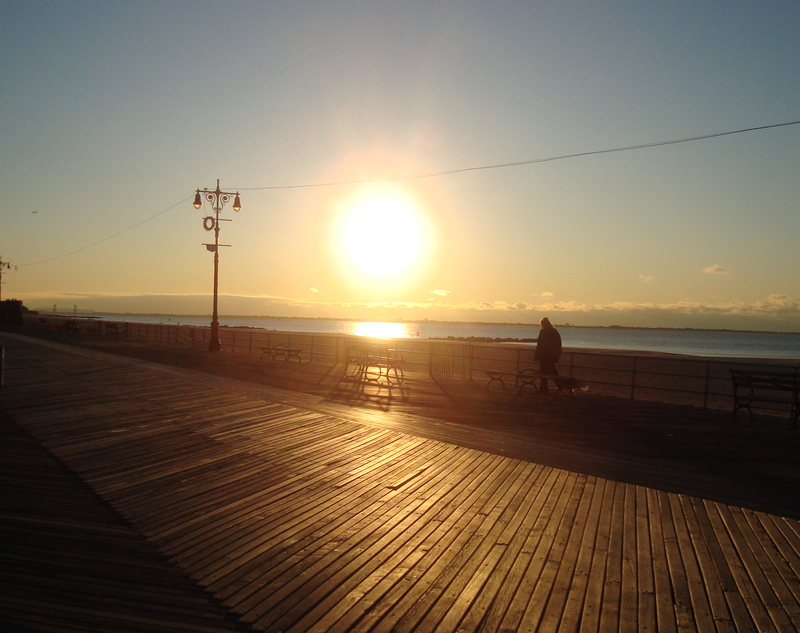 For me, the streets are the new sidewalks and the streets are the new boardwalk. I needed 4 miles to hit 1000 and that put me at 96 miles for the month of December. I probably won’t do a year in review sort of post OR a goals post for 2011. I simply just don’t really know. With my mom’s health fragile at best, I live 1 day at a time now. If I can run the races I signed up for in January ~ Fred Lebow Classic 5 miler on January 8th and Manhattan Half Marathon on January 22nd, I will be very happy. If I can run Coogans 5k on March 6th, I will be very happy. If I can run HATRun on March 19th. A 50k. 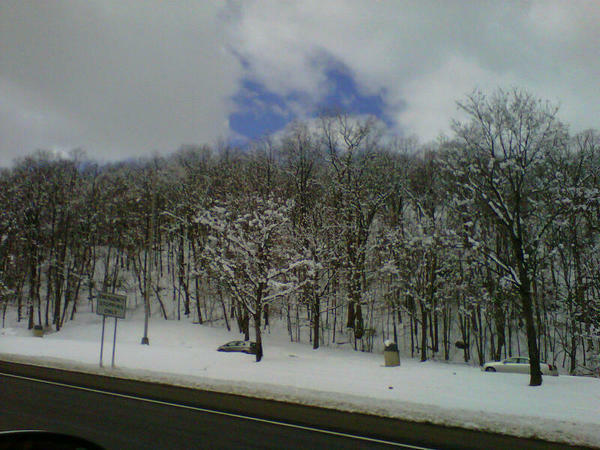 In Maryland. With so many cool Dailymilers, I will be ecstatic. And I can’t even think past that point. 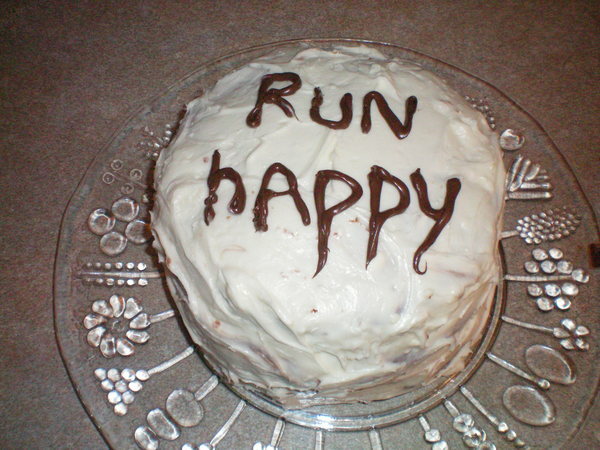 Happy And Very Healthy Running to you all in 2011. I’ve got a feeling, Michelle, that 2011 is going to be your kind of year. That you’ll be happier than you’ve ever been, laughing harder, smiling wider, standing taller, walking lighter, dancing crazier, hugging longer, living grander and loving louder. A turkey trot is an excellent way to start the 4 day Thanksgiving holiday. I haven’t run a race in a while so I thought, why not? It’s not far for me to travel to and its a throughly enjoyable race. 5 miles in Prospect Park with some hills thrown in. Met up with Scott before the race and I learned a thing or two about good pre-race execution. Just getting there early and giving yourself enough time to use the bathroom and perhaps make some good fashion choices depending on the weather. And then of course lining up with enough time to sort of “get ready” to run. I’ve run many races where I literally had only enough time to quickly use the bathroom and then run quickly to the corrals. So meeting up with Scott was a really good thing. It made me feel much more relaxed pre-race then I ever was before. So, my first week of HATRun training is in the bag. Two runs of 40 and 60 minutes. The Turkey Trot and then today a quality 8 miler. It has been a very long time since I have run this distance without taking any walk breaks. I really can’t even remember the last time that happened. Today, I thought to myself to give it a shot. Your mantra for this training cycle should be “Relaxed and Smiling.” Just have fun with it. All this mileage is going to make you fitter, faster, and stronger without even thinking about it. Walk breaks are OK, in fact, they’re encouraged on long runs. All that matters is you’re able to cover the distances without getting injured. So, on long days, enjoy the running and plan to take short walk breaks (because you’re going to during the 50k, just like everyone does!). Well, today I decided to see how far I could run without a walk break. I ran all 8 miles. I just kept it easy and steady. It didn’t feel too hard and I wasn’t breathing hard either. As the weeks progress and the miles become longer, I will absolutely take those much needed walk breaks. So, I am feeling confident that my running is finally going in the right direction. This coming Sunday I have the Joe K 10k race in Central Park. Again, no goals or expectations. I do need to get 10 in so perhaps 4 before. Or 2 before and 2 after. Running is a pretty good thing!!! !